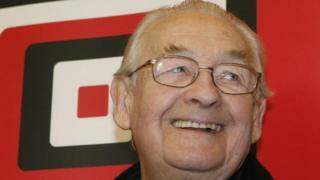 Oscar-winning Polish film director Andrzej Wajda has died aged 90, the Polish Filmmakers' Association has confirmed. He made more than 40 feature films in a career spanning 60 years. Many of his films - including Kanal, Man of Marble, Man of Iron and Katyn - were inspired by Poland's turbulent wartime and communist history. Wajda had been recently taken to hospital. Unconfirmed reports say he died of lung failure. Poland's former prime minister and the current head of the European Council, Donald Tusk, tweeted: "We all stem from Wajda. We looked at Poland and at ourselves through him. And we understood better. Now it will be more difficult." Film director and head of the Polish Filmmakers' Association Jacek Bromski told Polish broadcaster TVN24: "He was one of the greatest Polish artists, one of the best-known in the world. Poland was his passion. "For us, for the community he was a pillar of strength, everybody gathered around him. He was always present in the life of the film-making community, he was a mentor, a paragon." Wajda's last film Powidoki (Afterimage) tells the life story of the avant-garde painter Wladyslaw Strzeminski, who suffered under the post-war Stalinist government in Poland. The director said he wanted to "warn against state intervention in art". The film was recently chosen as Poland's official entry for the best foreign language film at the 2017 Oscars. Four of Wajda's earlier works had been nominated for that category. Man of Iron won the Palme d'Or at Cannes Film Festival in 1981. Wajda once said that "the good Lord gave the director two eyes - one to look into the camera, the other to be alert to everything that is going on around him." Other tributes included one from film critic Tomasz Raczek, who wrote on Twitter: "Polish cinema will be in mourning for a long time." Actor Daniel Olbrychski, who starred in 13 of Wajda's movies, including The Promised Land' and The Maids of Wilko, said he had never met another director who worked with actors so well. "We could feel the love of our audience through him. But when he frowned just a little, I knew I had to try and do it better," Olbrychski told TVN24. Wajda was born in 1926 in the north-eastern Polish town of Suwalki. His father was among the victims of the Katyn massacre of Polish army officers by the Soviet Union in 1940. Wajda tried to follow in his father's footsteps, but was rejected by a military academy, and joined the Polish resistance in World War Two. During the war, Wajda joined the Polish resistance. He later studied to be a painter, before entering the Lodz Film School. In 1955, he made his feature film debut with Generation, set during the German occupation of Warsaw in World War Two. It was followed by Kanal, and Ashes and Diamonds, which form a trilogy about life in wartime Poland. Some of his films found disfavour with the communist rulers of Poland because of their trenchant portraits of the wartime Warsaw Uprising and the suppression of the Solidarity movement in the 1980s. It was only after the fall of communism in 1989 that he was able to make his film about Katyn. "I never thought I would live to see the moment when Poland would be a free country," Wajda said in a 2007 interview with the Associated Press. "I thought I would die in that system. It was so surprising and so extraordinary that I lived to see freedom." Following Poland's first free elections in 1990, he served for two years as a senator in the upper house of parliament.